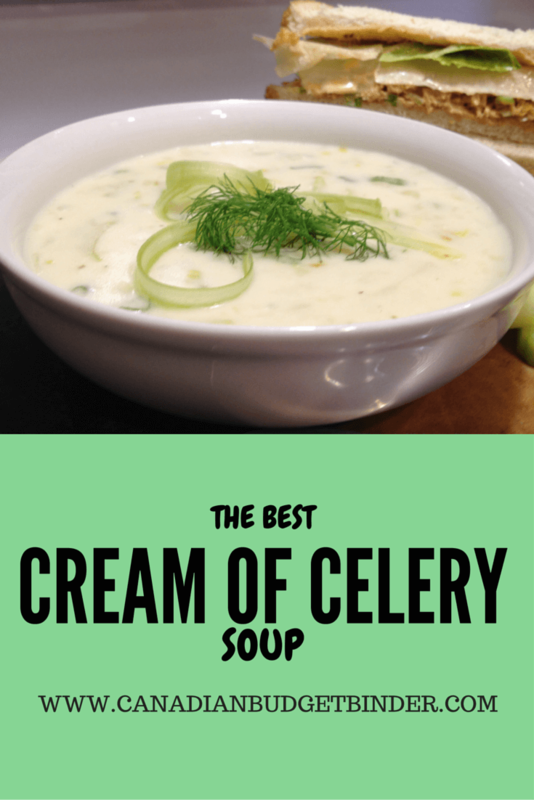 If you love cream based soups and have extra celery kicking around the refrigerator that needs using up this cream of celery soup will wake up your taste-buds and surprise your wallet. While I was looking in the refrigerator the other day I noticed that we had celery that desperately needed using up. Although I don’t mind eating raw celery with some cream cheese or a dip of some kind I wasn’t quite sure about cooking celery. I’ve added celery to a roast dinner or into the crock-pot to add flavour to my crock-pot creations but never have I mustered up a cooked celery recipe before. In order to use an ingredient you must understand what it is first. Celery (Apium graveolens) is a cultivated plant, variety in the family Apiaceae, commonly used as a vegetable. Depending on location and cultivar, either its stalks or its hypocotyl are eaten and used in cooking. In North America the dominant variety most commonly available in trade is “celery”, whose stalks are eaten raw, or as an ingredient in salads, or as a flavoring in soups, stews, and pot roasts. In Europe the dominant variety most commonly available in trade is celeriac whose hypocotyl forms a large bulb which is eaten raw grated in a salad, cooked, or as the major ingredient in a soup. It is commonly, but incorrectly, called “celery root”. The leaves of rapaceum are used as seasoning, but its fibrous stalks find only marginal use. Garbage gardening is new to me as I’ve never heard it being called that before but it makes sense. Most of what people throw in the garbage or compost can be used to re-grow the same product. My father-in-law does this with many of the plants he has in his garden. I guess once you become a master gardener you become the doctor of the garden. You know how to sustain life or create life from seed. I remember back a couple of year ago when the wife and I tried to grow celery from the base which we cut off, soaked and planted once the shoots started to show. It really does work as Mary and Tim will show you in their extensive post about Growing Celery Indoors. I love all the photos they provide and although our celery didn’t turn out as wonderful I’d imagine taking good care of it is key and I just didn’t have the time. Growing your own celery is certainly a great way to cut down on grocery expenses as it will be one less food item to buy when you shop. These days celery at the grocery store can cost about $2.99-$3.99 with organic celery costing even more. If we don’t buy celery we often look for fennel which is classified as the Italian celery with bite and also great for this recipe. It’s a great alternative for those of you who love celery but just not the huge prices. Even then fennel costs rise out of season. Right now fennel is in season which means you can find a nice large fennel bulb for about $1.00-$2.00 but expect to pay more for organic fennel. For this cream of celery soup recipe today I used Green Giant Celery which was beautiful but didn’t last long once I cut it up to soak in water. Typically I wrap celery in tinfoil as it will help keep it fresh longer in the crisper of your refrigerator. If you’re a skeptic, don’t be it works! This time though I cut the celery for my wife but she was too slow getting through it so I needed to use it up. What on earth will I make with celery ran though my already drained mind as I’ve been working countless hours at work. Luckily I was off for a few days because of a major ice storm in Ontario which meant still no catching up on sleep. Our son never leaves me alone because he gets so excited when I’m home which means whatever I do he’s right there beside me. Since our son is a huge fan of making pretend soup in the pot he was banging away while I made a pot of cream of celery soup. Win-win especially when he sees daddy cook as I’d like him to learn how to cook so he doesn’t cash out on convenience foods as he grows older. I’m a big fan of spit pea with ham soup, cream of cauliflower soup, cream of potato soup, cream of tomato soup…cream of just about anything soup. Although I’ve never made cream of celery soup before I’ve made plenty of cream soups in my time. Using the same concept as I do to make my other cream soups I’ve created this delicious Cream of Celery Soup. If you’re not a fan of the creamy part you could always leave the flour, cream and milk out of the recipe and have this as a flavourful celery soup which is broth based. Since my wife eats a Low-Carb diet the broth based soup without the sugar is perfect although her diet permits cream. I was hoping to find an alternative soup thickener instead of the flour but I’m still on the hunt. If you have any ideas I’d love to hear them. Garnish this gorgeous bowl of soup with celery leaves, shaved celery or fennel greens like I have. 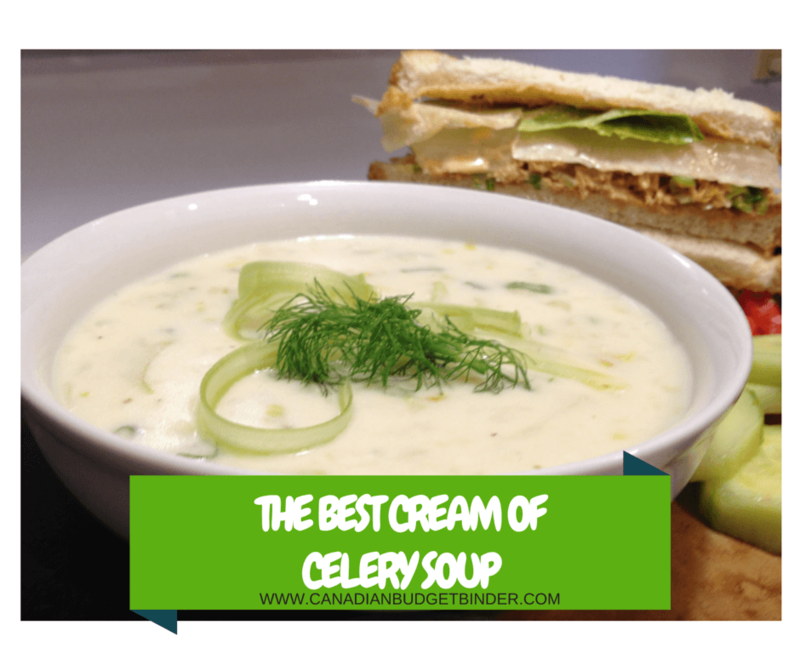 If you love cream based soups and have extra celery kicking around the refrigerator that needs using up this cream of celery soup will wake up your taste buds and surprise your wallet. In a large pot melt the butter on medium heat then add the diced onions, garlic and celery then cook for about 5 minutes until translucent. Serve with sandwich or salad of choice. If you find the soup is too thick you can cut that with a bit of hot water. Once you know how to make a cream based soup you can pretty much turn any vegetable into cream of something soup. Leave those cans of soup on the grocery store shelves and indulge by making homemade cream of celery soup for your family tonight. Enter your email address below to SUBSCRIBE to my blog. Once you subscribe you will be sent an email from me which you need to open and approve the subscription in order to start receiving my daily blog post. Thanks for joining CBB! The celery soup looks so delicious Mr. CBB. Thanks for sharing this recipe. 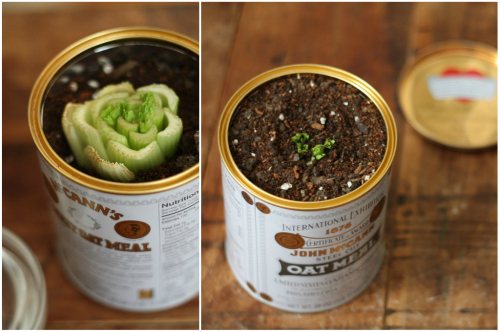 By the way, I am planning to plant it in my small garden as it is easy to do it. No problem. This soup is delicious and super frugal if you are looking for easy meals that don’t bust the budget.